Global currency markets have remained remarkably sanguine even as mounting U.S.-China trade tensions roiled equities. How long can that uneasy calm last is the question strategists are now grappling with. 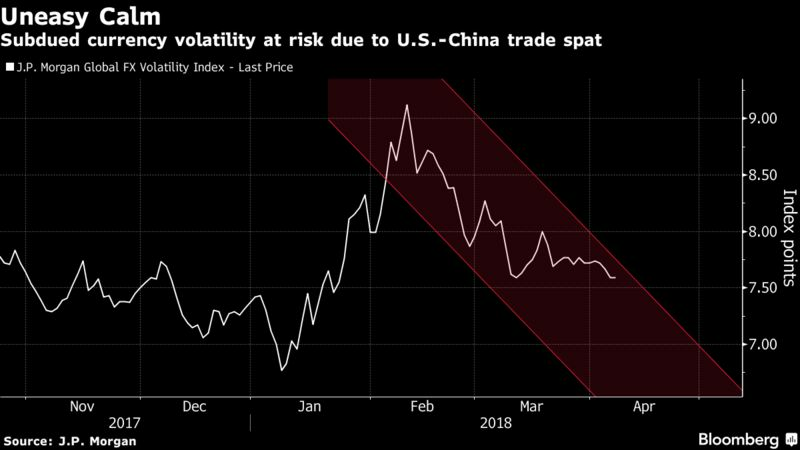 Even with U.S. President Donald Trump and Chinese officials volleying proposals to impose tariffs and counter-tariffs, the J.P. Morgan Global FX Volatility Index is on course for a third weekly decline. But the foreign-exchange market could quickly lose its poise and currency swings could widen should the threats escalate into actual implementation of the tariffs, according to analysts. “Currency markets have taken on the role of a casual observer, with the initial trade war firing shots taking place on the equity market battlefield,” said Viraj Patel, a strategist at ING Bank NV. The tariff threats turning into reality “would be the catalyst for the trade war market dynamics to spillover into the currency arena. One could expect a sharp adjustment and higher volatility in trade-sensitive currency pairs,” particularly in dollar-yen, he said. China said on Friday that it would fight U.S. protectionism “to the end, and at any cost,” after Trump ordered his administration to consider tariffs on an additional $100 billion of Chinese goods. European Central Bank Executive Board member Benoit Coeure saidthe trade spat picked by the U.S. risks increasing the burden on central banks by dimming global growth prospects. The yen rallied as much as 0.4 percent in early Asian trading on Friday, given its appeal as a haven currency, as China’s statement fueled risk aversion. The Japanese currency pared gains to hold steady at 107.34 per dollar as of 12:40 p.m. in London. The Bloomberg Dollar Spot Index was set for a second weekly advance. The U.S. Treasury will likely release its semi-annual currency report in mid-April. While still a low-probability risk, any move in the report to formally label China as a currency manipulator “would be a clear escalation in U.S.-China trade and political tensions and a risk-off trigger” according to ING’s Patel. While foreign-exchange markets have faced only relatively short-lived episodes of volatility in recent years thanks to the assumption that central banks will defend financial stability, uncertainty about Trump’s policies is posing risks, according to Jeremy Stretch, head of Group-of-10 currency strategy at Canadian Imperial Bank of Commerce. For now Stretch doesn’t see those risks as a central scenario and predicts foreign-exchange volatility to remain contained.